The Ravelympics continue at a furious pace. I bought seasons 6 and 7 of The X-Files to keep me company while I knit. How much have I watched? All of season 6 and a third of season 7. 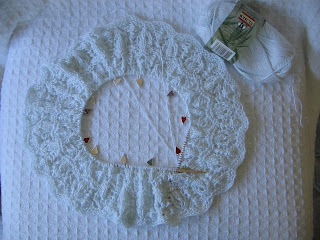 The Lotus Blossom has almost two complete lace repeats. That may not sound like much, but remember it's 230 stitches on each row. 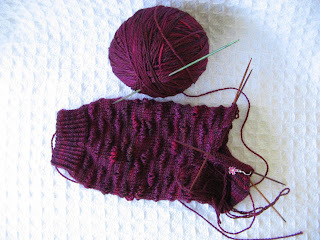 And the first sock is more than half finished. Mulder: Where'd she get this superhuman speed? A bend in the space time continuum? A gravitational aberration? This is something science can't explain. Scully: And maybe she's just a bored housewife. Anne, the Lotus Blossom lace is gorgeous! How is the bamboo yarn to work with? I love the colour of the sock yarn too. ...I think you have a serious problem. Once the Olympics is over, we're going to have to hold an intervention. The two projects are looking very good.